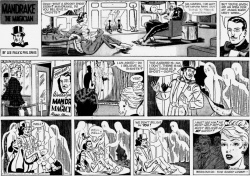 "The Ghost Lover" is the 92nd Mandrake Sunday story. The story was written by Lee Falk and drawn by Phil Davis. Joan thinks she has fallen in love with a ghost and seek Mandrake for help. Rolo 19, an observer from Magna and the ghost lover. The story title is taken from the strip of March 17th, 1963 (Beginning: The Ghost Lover). At Magna the average life span is three thousand years ! This page was last edited on 25 June 2017, at 18:10.